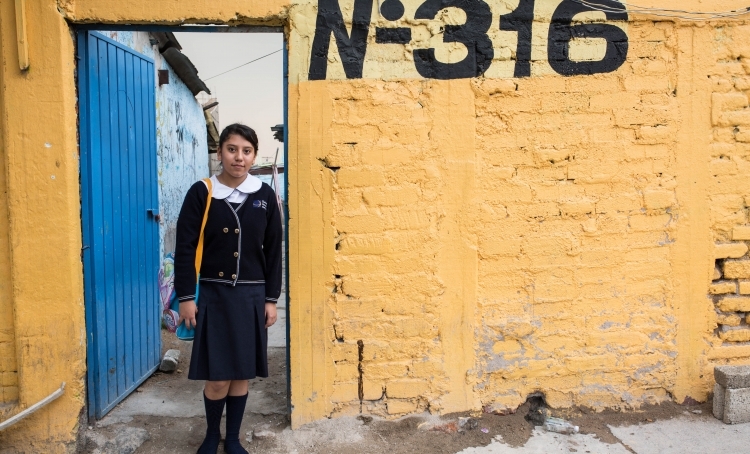 Esmeralda lives with her parents and two siblings in Mexico City. Her small house is hidden behind a yellow brick wall, hardly noticeable off the busy urban street. The home has an aluminum roof and bootlegged electricity. Old construction materials and rubble are piled up around the outside of the home. The family of five sleeps on one small bed and a mattress on the floor. Several families share an outhouse. Esmeralda loves attending school at Christel House—and she is thriving. “When I go to Christel House, I am happy,” she says. “I am not sad or nervous because I don’t have the same problems.” She is grateful for all the new opportunities she has received at Christel House. “The teachers are excellent. I am learning new subjects and I understand a lot of English now. I receive clothes for school. School supplies and books are given to me. I see the school psychologist and she helps me. Christel House is excellent because they help me and I don’t have to pay. I think I will have more opportunities in life.” She dreams of one day traveling and teaching history. Support a student like Esmeralda today.